Utagawa Kuniyoshi (1797-1861) Miyamoto Musashi Fighting Shirakura Dengoemon, 1851. Oban diptych. Click here for a 1:1 image. This vibrant print pictures the legendary swordsman and poet Miyamoto Musashi (1584 - 1645), author of The Book of Five Rings, a text on strategy, kenjutsu and the martial arts. His work is still in print and widely read today by martial arts enthusiasts. Musashi was an extraordinary character, the finest swordsman and duellist of his day and an accomplished artist and scholar. He fought his first duel at thirteen and then lived as a kind of western gunslinger for the rest of his life. This fight however does not come from his many real encounters but is taken from a novel of his life which was later turned into a play for the kabuki theatre. In the play Chigusa no akitsuki ni Miyamoto, Musashi arrives at an island in pursuit of an enemy. He enrolls as a teacher in a fencing school run by Shirakura Dengoemon who is jealous of his skills and plots to kill him by getting him drunk and locking him in the bath house without his sword. Musashi comes to in the steam room and bursts out wielding a broken beam, surrounded by Dengoemon’s men. In the following fight scene, Shirakura Dengoemon is killed and Musashi escapes having also killed Dengoemon’s wife. 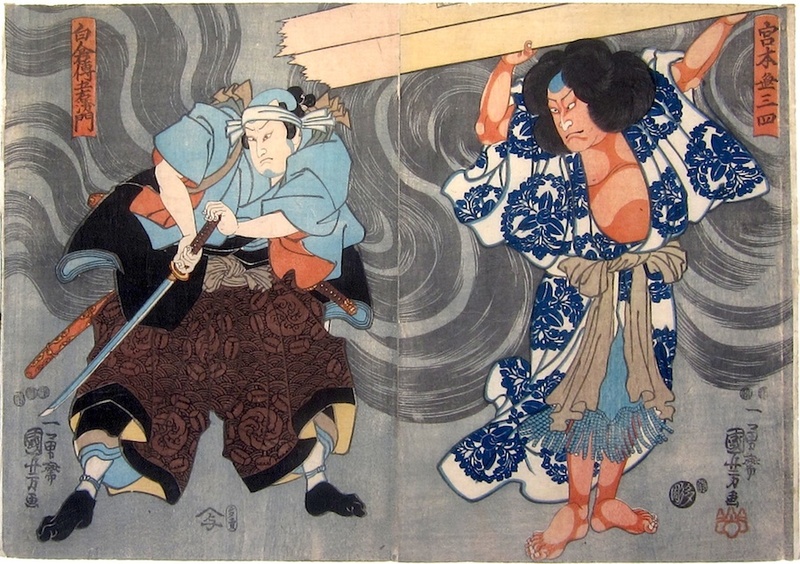 In Kuniyoshi’s print, we see Musashi with the beam raised about to kill Dengoemon who is fumbling with his sword. The superb decorative background represents the steam from the demolished bath house. This is a fine, dramatic print and better than the more widely known triptych of the same scene. The pattern of steam forms a dynamic backdrop against the two richly embroidered figures. The print formed part of the Stokes collection and is in very fine condition, untrimmed and joined. The colours are undimmed and the impression is very good indeed. The role of Dengoemon is played by Asao Tamejuro IV and Musahi is played by Nakamura Utaemon IV at the Kawarasaki Theatre.